Most printers have a software based control to move the print head up or down to adjust for paper thickness. Review the screen shots below and refer to your printer's manual for more help on the topic. Open your printer's Printing Preferences dialog. Locate and click on the Paper Config button. The PLATEN GAP controls the distance from the print head to your paper. Begin changing platen gap for papers that are over 11mil thick. Choose Wide (Wider if available) when you make this adjustment. 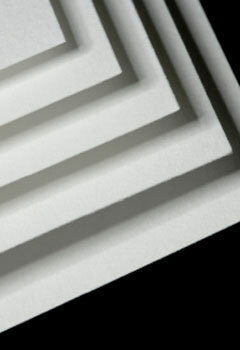 If your paper is between 12 - 15 mil thick, set Paper Thickess to 4. For papers 16 mil and thicker set Paper Thickness to 5. Consult the paper's handling guide if available for specific advice. Epson desktop printers have a Thick Paper or Envelope setting. 2. Click on the Printer and Optional Information button. 3. Check the Thick Paper or Envelopes check box. When the Thick Paper setting is checked you may see a warning before each print job begins. For the Epson R2000 and P400, the feature name and location are quirky to say the least. Go to the printer properties and click on the Utility tab. On a Mac you will look for an EXTENSIONS SETTINGS menu in the Print dialog. Depending on your printer and version of OSX, this setting may not be available. Canon desktop printers have a Prevent Paper Abrasion to minimize head strikes with thick paper. On a Windows computer, go to the printer preferences. 3. On the next menu click the PREVENT PAPER ABRASION check box. When the Prevent Paper Abrasion setting is checked you may see a warning before each print job begins. Locate your printer, single click it to highlight, then click on Options and Supplies. Click the Utility menu and then click Open Printer Utility. Click the PREVENT PAPER ABRASION check box and click apply. Note: Your printer will need to be turned on and connected. Canon wide format printers have a setting called Head Height. It must be set from the printer's control panel. As far as we can tell, HP printers do not have a thick paper or platen gap setting available to the user.